Ok I have never made a mosaic and didn't actually make this one either. I asked my daughter to help me and like a wizard she click, click, clicked and tada there is a pretty mosaic. 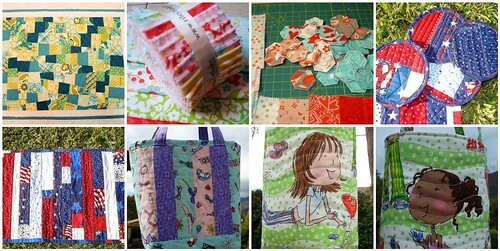 I am gonna need help again for the next one......Linking up with Fresh Sewing Day @ Lily's Quilts. great projects! I know there is a "how to make a mosaic" on a discussion board in a flickr group I am in. It is the 3x6 Bee Group. Hope it helps. Thanks for the info on the mosaic. After it was all done I remembered more projects. Oh well just means I need to practice! Thanks for visiting! Lovely projects - and you could also use a site like Big Huge Labs to make the mosaic.